Two post in one day! I have so much catching up to do...I pulled out my ribbons and got right to work. It's such a blessing to love what you do. I love to make tassels! I couldnt resist showing yall what I did yesterday. Please forgive the photographer cause it was after midnight and you know what that does to a picture..
My pride n joy! You know I will have to make me one now. I love this tassel that much! I couldnt help myself... I had to put toile on a pumpkin... you like? I could use this ribbon on everything! I couldnt leave out a rooster... he reminds me of Sunday morning breakfast! So now you know what I did all day yesterday and very early this morning.. It's so good to be back! If you like these and want to see some more head over to my Etsy. 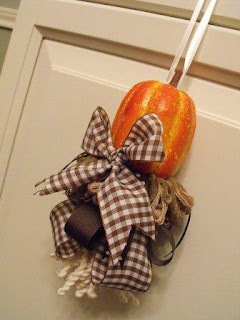 love the pumpkin and toile! what a great combo. 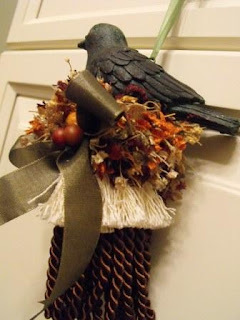 you have just the best fall ideas, hope i can recreate some of them at our home. i'm trying out the spooky branches (how i wish north mississippi had moss hanging from it's trees:) thanks for all the inspiration! That pumpkin mixed with black toile is perfect. I love it. So glad you are back!! I can't believe that black bird is gone already!! I love, love, love the toile and the pumpkins. OH MY! So pretty! As always, so cute!!! I love them ALL! 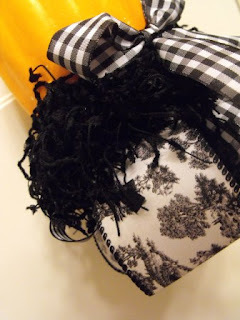 Black toile & a pumpkin is such a beautiful idea. But I think the rooster is my favorite! I'm glad you were able to spend some time doing what you love, and that it made for a happy day. The photos in the previous post are such an inspiration! Always love some toile! They look fab! You are very talented! Do you ever make seashell tassels? This isn't a good thing to be showing me all these tassels! 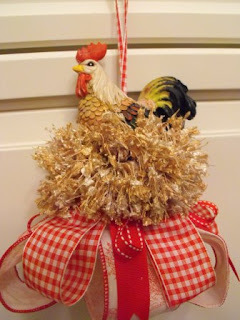 I LOVE the gingham ribbon!!! 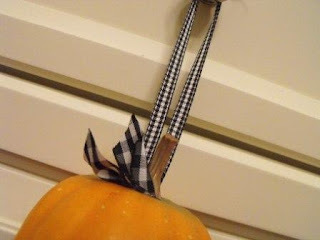 I LOVE the toile ribbon on the pumpkin! Of course, I love toile on anything. sooooooo cute! I am loving the pumpkins against the black and white! I love the orange and black together it looks great! Love the tassels. Can't wait to see you at Canton. I had the choice of 3 days in Baton Rouge with my hubby or going to Canton and I chose Canton. I can't miss it again! I would love to shop in Baton Rouge, too, but I can't be in 2 places at one time. How I love your tassels! They are beautiful!!! Your tassles are SO cute and festive!!! Just FYI...I was at Target the other day and saw that they had vine-ish pumpkins in the cheap/dollar section...they had medium and small ones! They were supe CUTE and super worth the money I spent on them! You make the prettiest tassels! While I do love toile, I'm a bit partial to that bird tassel. Gorgeous! Each one is just a adorable. I wish I could buy them all! But especially the toile! You know-I jut can't resist me some toile! I can handle two posts from you any day! 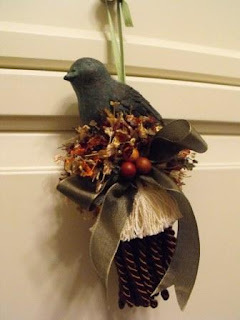 I want the bird tassle with the berries!! Has anyone spoken for it yet?! The black bird is gone already! Love it! Love them all! Love love love the tassels! If I had to pick a favorite, I guess I'd pick the first one, the pumpkin and black and white ribbon. SOOOOOOOO CUTE!!! 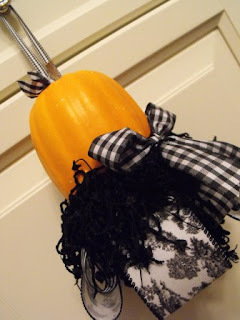 I love the pumpkin and toile tassel! Beautiful! These are definitely some of your BEST works. LOVE EM! 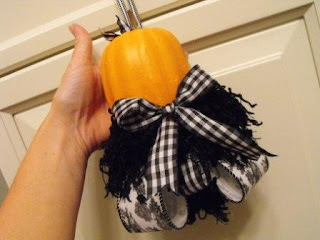 I love the toile pumpkin tassel the most (I'm just a wee bit partial to toile). Actually, I love all of your tassels!